TERMINATOR QUESTIONS Volume Two: Answers on how a T-1000 time travels, how many T-1000s were in “Terminator Genisys” and are the T2 and Genisys Terminators the same! Sometimes even the biggest Terminator fans can still have questions when it comes to the time-travelling universe they know and love. And we are here to help! As a regular feature on our social media pages, it is our aim to provide answers to some of the most perplexing Terminator related questions around! Now if you don’t follow us on Facebook or Twitter, don’t fret. We have collected all of these solved Terminator riddles into a single volume that you can read here! And who knows, even the most die-hard Terminator Fans might just understand the franchise they love.. just a little bit more! 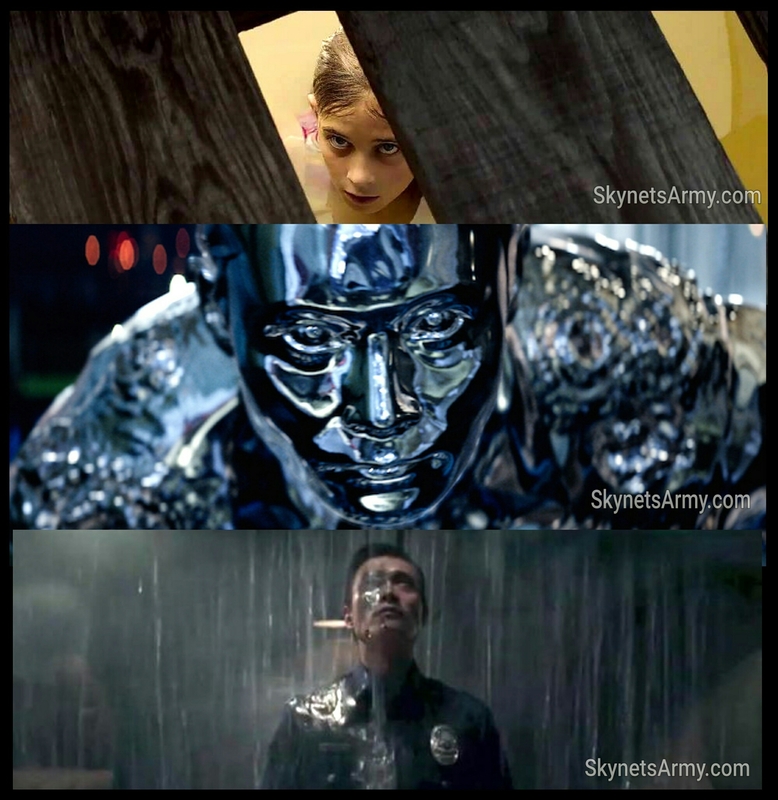 QUESTION #1 : Are there two different T-1000s in “Terminator Genisys” (one sent to 1973 to kill young Sarah Connor and another sent to 1984 to kill Kyle Reese)? Or is it the same T-1000? 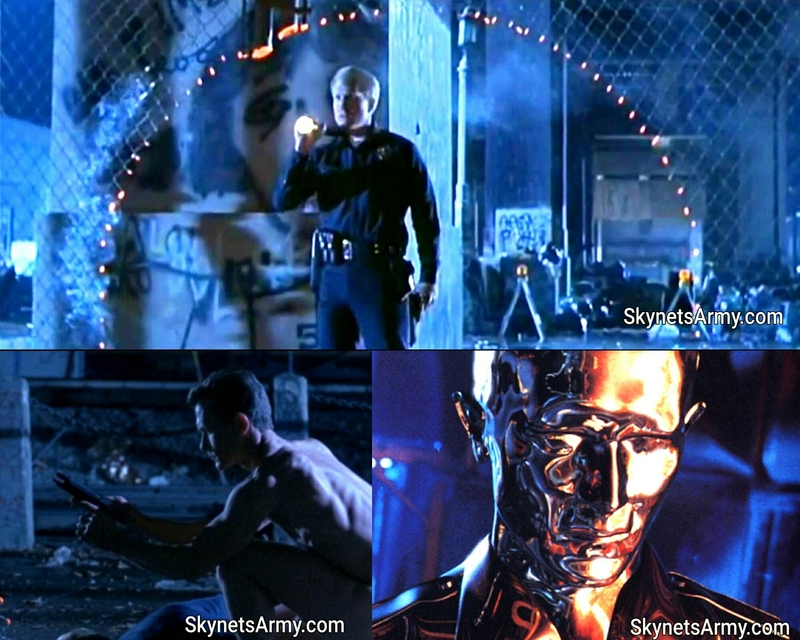 ANSWER : It is the same T-1000. When the T-1000 was sent to 1973 to kill young Sarah, it was stopped by the Guardian T-800. Detailed in storyboards that were never filmed, the Guardian shot the T-1000 over the lake with a rocket launcher, sending him in pieces to the water’s bottom. By time the T-1000 was able to reassemble and resurface, the Guardian and Sarah were long gone. Sarah and Pops knew the T-1000 would likely reacquire them that night too, and that is why they prepared an acid trap to finally stop their liquid metal pursuer. As writer Laeta Kalogridis put it, “..when she kills that thing in the acid, she’s killing the thing that killed her parents”. It took over 11 years for Sarah to get her revenge, but she got it. QUESTION #2 : How did the inorganic T-1000 travel back through time using the Time Displacement Device when only living organisms (or beings surrounded by living tissue) can go through? 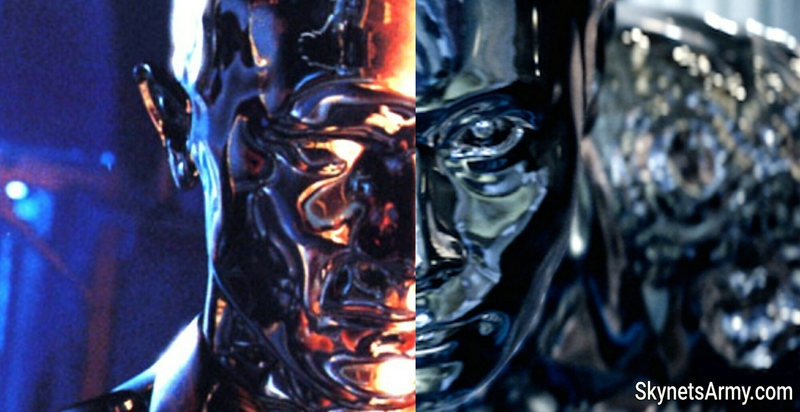 While many fans theorized that the T-1000 possibly could mimic human skin so flawlessly that it can fool the Time Displacement Device that it was organic, and others hypothesized that there was a more technological advanced time machine that Skynet used to send the liquid metal prototype through, writer and director James Cameron’s explanation was a bit more macabre. Skynet actually wrapped the T-1000 inside a flesh cocoon, grown with the same “skin” technology used to create infiltrator T-800 cybernetic organisms. Once the T-1000 traveled through time inside the flesh cocoon and reached its destination, the liquid metal killer would shed the flesh cocoon and begin its mission. While visually interesting, Cameron ultimately felt the cocoon scene would be too confusing for general audiences so he cut it out of the final shooting script, settling to just leave the T-1000’s arrival happen off-screen. 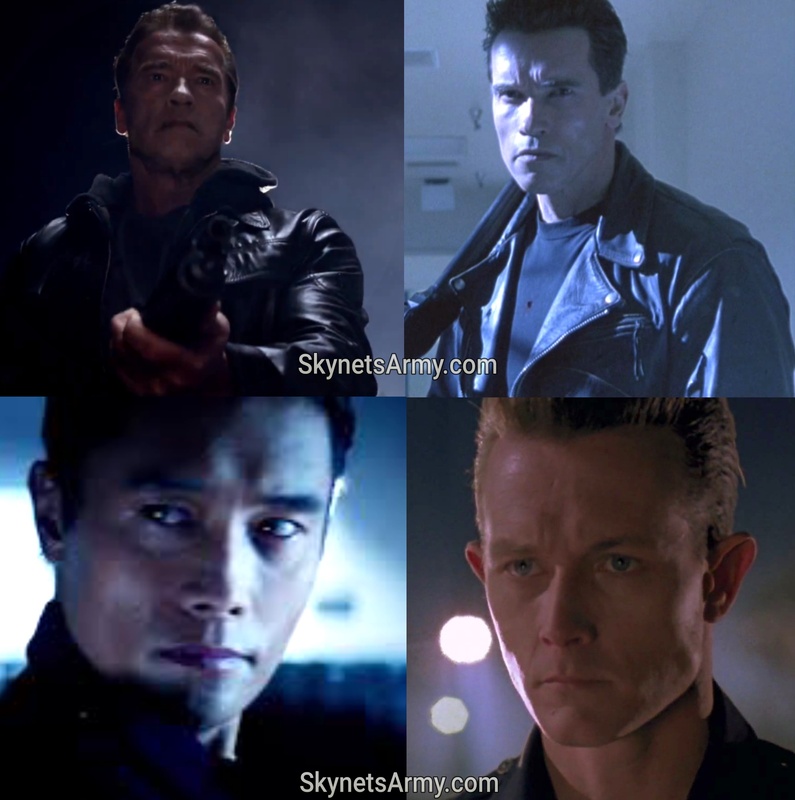 QUESTION #3 : Was the T-800 Model 101 and T-1000 sent back through time in “Terminator Genisys” the same exact Terminators that were sent back through time in “Terminator 2: Judgment Day”? The events in the original film “The Terminator” follows a different time travel paradigm than the other Terminator movies. The events of the first Terminator film is a closed loop, so everything contained within that story repeats itself over and over again. However, the events that took place in “Terminator 2: Judgment Day” operate on a branching timeline theory, where Sarah decides to try to change the future while never stopping to think that (if she’s in a closed loop) her son John Connor would cease to exist the moment Judgment Day is prevented (because a post apocalypse Kyle won’t time travel back to 1984 to father Sarah’s baby). So the events of T2 is a divergent timeline from “The Terminator”. The events of “Terminator Genisys” is ALSO a divergent timeline from “The Terminator”. This means the events of “T2” and “Terminator Genisys” do not exist in the same timeline. So therefore, as writers Laeta Kalogridis and Patrick Lussier confirmed on the red carpet of the film’s premiere, the T-800 Model 101 and the prototype T-1000 from “T2” were most likely the same Terminators sent back through time in “Terminator Genisys”. That would mean the odds are “Uncle Bob” is also “Pops”. And considering the T-1000 was a prototype, it was definitively the same Terminator. Post Script: It’s important to remember writers Laeta Kalogridis and Patrick Lussier chose to ignore both T3 and “Terminator Salvation” as canon when writing “Terminator Genisys”. We’ll be back with Volume Three! Previous PostWhat ever happened to Skydance’s New TERMINATOR Television Series?Next PostJames Cameron and Arnold Schwarzenegger celebrate finishing the 3D conversion of “TERMINATOR 2: JUDGMENT DAY”!